SSG Tadashi Sasahara of the 441st MID survived the siege at Khe Sanh in the Spring of 1968. When assigned to the Khe Sanh combat base (just before the siege), no one gave consideration that SSG Sasahara's enlistment was about to end. During the siege, he volunteered to be flown out of the combat base to re-enlist at C&C at DaNang. Then he flew back into Khe Sanh for the remainder of the siege. 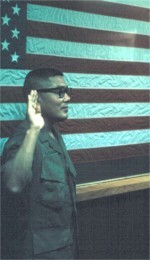 His 1968 re-enlistment photo is below. Such exemplary NCO's were the backbone of the 441st on Okinawa.